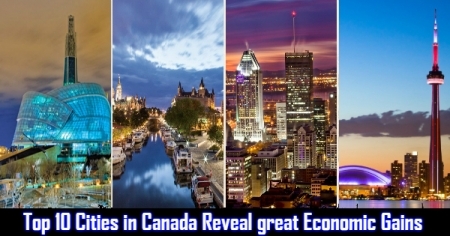 As per the Bank of Montreal, Seven Canadian cities get a mention in the recent list of the best cities to find a job. This is a proof that the labor market is working very well in Canada. It has emerged from oil-related decline in Alberta, and shows a good gain in British Columbia and Ontario. Moncton, New Brunswick is on the top of the Bank’s quarterly Regional Labor Market Report. This is a huge victory for the Atlantic Provinces. The city has made a big movement of 32 places in the past 12 months, in comparison to the position in 2017. The Employment in Moncton has increased by 10 percent in one year. Also Moncton serves as an example that smaller cities can register good progress. Furthermore, the city was the center of attraction for more business investments. Moreover, the employment level was a six-year low in 2017. A few Major cities also figure in the top 10. Vancouver has a standing of No 4 and Toronto is at No 6. Montreal has the 16thplace in the list of most populated cities. The prosperity of major cities has created a positive trend, for others in the country. Out of the ten provinces in Canada, Six have a job growth of 3 percent, but Newfoundland & Labrador show a negative in 2017. Presently, the job growth of Alberta is 1.8 percent. 1) Moncton, New Brunswick has an Employment rate of 63.3% and has seen a change of plus 9.9% in Employment rate in comparison to the last year. The Unemployment rate is merely 5.7%, registering a decline of 2.0%. 2) Abbotsford, located in British Columbia has moved up by 7 positions in comparison to the last year. Presently, it has an Employment rate of 62.9% and the change of plus 2.9% in Employment rate to 2017. Unemployment rate is 4.0% seeing a change of minus 2.3%. 3) Oshawa, Ontario increased its position by 16 to 2017. 4) Vancouver, British Columbia moved Up by three positions in the last year and has an Employment rate of 64.9%seeing a change of +4.7% in the last year. Presently, its Unemployment rate is 4.0%. 5) Kelowna, British Columbia has moved down by three positions in the last year. Employment rate is 63.9% seeing a rate change of +4.6% in the last year: the Unemployment rate stands at 5.2%. 6) Toronto, Ontario has seen a steep increase of 10 positions. Its Employment rate is 62.4% seeing a +3.2% change in Employment rate the Unemployment rate is 5.8%. 7) Quebec City, Quebec is showing a slight decrease of one position in comparison to 2017. Additionally, its Employment rate is 67.0% and the change is 2.3% Unemployment rate is healthy at 3.6%. 8) Saskatoon, Saskatchewan went Up by 13 positions and has an Employment rate of 64.3% seeing a change of plus 1.4% Unemployment rate stands at 6.5%. 9) Edmonton, Alberta is also up and the Employment rate is 66.2%. The Employment rate change is +0.6%and the Unemployment rate is 6.7%. Furthermore, Ottawa is placed at eleven and Montreal at 16.